Keeping your headlights clean and clear is so important. 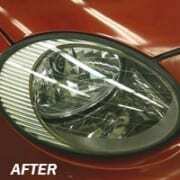 Clear headlight lenses increase your safety and they improve the overall appearance of your vehicle. What good is detailing your vehicle if you’re going to leave the lenses yellow and cloudy? We apply a compound specifically made for restoring headlights. 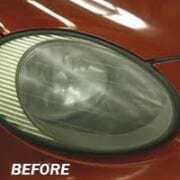 We can hand or machine buff to restore headlights to a like new clarity. Price will vary depending on condition of the headlights. Depending on condition of your headlights, additional time and steps may be needed to complete the Headlight Restoration.